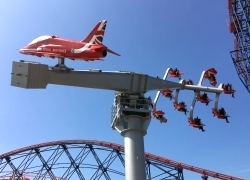 Blackpool Pleasure Beach continued its traditional embracing of all things British when it announced a Red Arrows-theme ride. 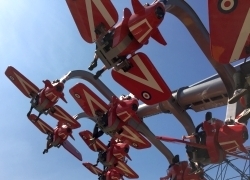 Comfortably slotting in adjacent to rides with Union Flag trains and others honouring horse racing, Sky Force and its Royal Air Force branding is highly appropriate. Clean, shiny and sparkling – as all new things are – the colours are vibrant and the ride station modern, with its small flat screen monitors displaying instructions in the indoor queuing element. Outside, the galvanised steel cattle-pen is likely to see heavy queues during the busy summer period, with the ride’s operating capacity considerably less than 200 riders per hour. The ride’s 12 single-seater carriages are comfortable, flanked either side by wings which each have a handle. When the arm begins to rotate – which it does eight times during the current cycle being ran – you are able to attempt to make your carriage spin 360 degrees repeatedly. There is a technique where you need to combine rocking from side to side with pushing forward on the opposite side to what you rock, while pulling back on the side you rock to. This is difficult to master on the first attempt, and we failed to complete a single roll on our first ride. People’s first rides, particularly after queueing for a long period, could lead them to forming a negative view of the ride. However, taking advantage of a quiet midweek term-time day at Pleasure Beach, re-riding was a relatively easy for us, and on the second attempt and re-studying of the instruction video, it was possible to achieve relentlessly fast spinning action. Understandably this can get too much for some, and the carriages are stabilised relatively quickly when you let let the wings return to their natural position. A windy day also heightens the spin factor, and while this is close to nauseating – it is quite in that zone as some have unfairly claimed. The ride does lend itself to re-riding to master the technique and increase the ride’s enjoyment, but with such a low capacity the question has to be asked how many guests will get that opportunity. Sky Force is without a doubt a unique selling point for the Pleasure Beach and you can have a reasonable amount of fun with it, but its level of success with the public hard to predict.